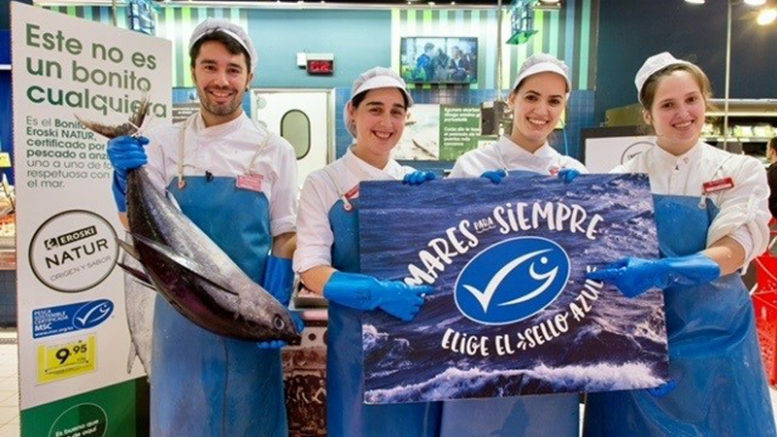 Spanish supermarket chain Eroski announced this week that it is offering its shoppers three new certified “sustainable” seafood products, building on its achievement last year of becoming the first Spanish food retailer to meet the international Marine Stewardship Council (MSC) certification requirements for chain of custody of fresh fish products from sustainable fishing grounds. The supermarket chain, which has nearly 1,000 retail outlets across Spain and is run as a worker-consumer hybrid co-operative as part of the Mondragón Corporation group, will now offer lobster, unsalted cod trays and surimi products bearing the blue “MSC” seal of sustainable fishing. Eroski kicked off its shift toward sustainable products on its fresh fish counters last March, when it began marketing more than 1,000 tonnes of skrei cod, Cantabrian anchovy and albacore, the first three of its blue-seal certified products. 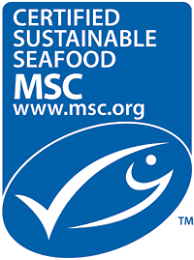 Marketed under the Eroski Natur brand, the blue MSC seal on the fish products means that the products have passed audits by both the fishery and companies involved in the entire fish handling process, so that sustainable practices are guaranteed throughout the chain of custody from fisheries to consumer. The retailer projects that by 2020 it will be selling 2 million kilos annually of its blue-seal products under the Eroski Natur brand.